No Irish Need Apply unless they want to be on the podcast. Because we love to feature Irish and Celtic music from The Rowan Tree, Old Man Flanagan's Ghost, Whiskey Bay Rovers, Lunasa, The Gothard Sisters, Moonrakers, Arthur Hinds & the Round Table, W Ed Harris, Spirited Lads, Sliotar, Brad Tuck, Heavy Blarney, Clover's Revenge, Marys Lane, House of Hamill. Listen and share this podcast. Download 34 Celtic MP3s for Free. Subscribe to the Celtic Music Magazine. 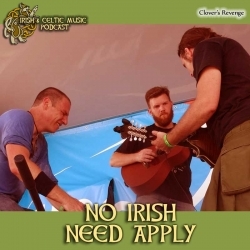 This is our free newsletter and your guide to the latest Celtic music and podcast news. The Irish & Celtic Music Podcast is here due to the generosity to not only our kind Patrons of the Podcast, but also to the generosity of Celtic musicians. Artists give us permission to play their music on our show. If you know of a Celtic artist that you think should be featured on the podcast, there's two things you can do. First, email the artist. Ask them to submit at 4celts.com. The form is quick and easy. They'll find out how to send music directly to the podcast. Second, drop me an email. Tell me you emailed the artist. And I can check in with them in a couple weeks. Best and Worst of the Isle of Skye on Celtfather Music & Travel. Special thanks to our illustrious Celtic Legends: Nancie, Hank Woodward, Bryan Brake, Scott Benson, Hunter Melville, John Bilderback, Kevin Long, Annie Lorkowski, Derek Lineberry, Lynda MacNeil, John Sharkey White, II, Theresa Sullivan, Shawn Cali. These super generous people pledge $10 per episode to keep this show running each and every week. Scott McPhee emailed: "I discovered this podcast after it was mentioned in a column called RD Recommends in Reader's Digest. From the podcast dated 18 January, 2018, I want to find out the titles of two songs that were played. One was by Screaming Orphans. The other was by The Founding." Amy Goodwin emailed back in March: "Hi Marc, Caught a bit of your live feed last night- our delta internet couldn’t quite keep up with the live aspect. Managed to see a few songs- including the one about the cats knocking over glasses. As one who lives with toddlers, I found the song very relevant! We’ve been listening to the podcast the past weeks while decking the house out in green and getting out all of the kids’ leprechaun books. In case your kids are interested, a few of our favourites are Jamie O’Ruorke and the Pooka, Fiona’s Luck, and That’s What Leprechauns Do. We were in B’ham last weekend for a birthday party and got to see some of the new Jetsons interstate construction y’all have going on. What an ambitious project!" Amy Goodwin emailed: "Today, we’re listening to the podcast while... the small children are using the hose to “wash” the hammock. husband is hunting the snake that threatens the chickens/kittens. I am getting ready to enjoy national wine day!" Danielle Vergara emailed: "Hi Marc, I just wanted to write to you to thank you for this lovely podcast. There is such a great variety of music, and a great selection of artists. Being a 17-year-old visually impaired musician that plays a lot of Trad Irish music, it's wonderful to see a podcast that is dedicated to Celtic music! With that being said, I shall continue to be a listener, and this podcast shall continue to help me with schoolwork!"